Investors played a large role in driving both the housing boom and bust. Investor related foreclosures were responsible for a non-trivial number of foreclosures, resulting in nearly 20% of foreclosures nationwide. Our recent study finds that neighborhoods with more foreclosed properties that were previously owned by an investor leads to short-term property crime bursts in communities. Why might this be so? Any foreclosed property runs the risk of being abandoned, falling into disrepair, or becoming a site for criminal activity such as burglary, drug dealing, gambling or prostitution. However, for foreclosed properties that were previously owned by an investor, these consequences might occur more quickly or more severely. Investors are motivated by profit making them more sensitive to changes in housing market conditions. As a result, investors may be more likely to default on their mortgages and walk away from their properties when housing prices decline. Investors are also both physically and emotionally detached from their properties and neighborhoods and do not face the social pressure from neighbors to maintain their property. Furthermore, since investors likely rent their properties out, tenants might be evicted and the property could become vacant, quickly falling into disrepair. Thus, crime, decay, and blight are more strongly associated with the failure of investors to retain ownership of their property. City of Chandler, AZ: Monthly crime, investor and owner-occupier foreclosure Dynamics (2007-2010). 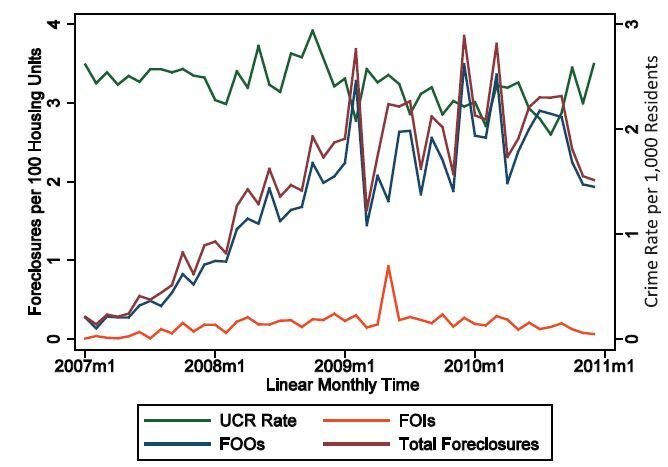 UCR Rate = Uniform Crime Report; FOIs = Foreclosure on Investors; FOOs = Foreclosure on Owners. Figure from Article. All these consequences of foreclosures – especially those that are investor related – can cause upheaval in a neighborhood, undermining residents’ ability to address problems informally. We examine the destabilizing effects of investor foreclosure on crime in Chandler, Arizona, a fast-growing city in the Sunbelt region. We find that neighborhoods with a greater number of foreclosures on investors have both immediate and short-term effects on crime. Neighborhoods with more foreclosures on investors relative to owner-occupants experience an increase in property crime within the same month, and this effect persists for the next three months but diminishes thereafter. In contrast, neighborhoods with more foreclosures on investors relative to owner-occupants have no immediate effects on violent crime, but have a negative, depressive effect on violent crime in the months following a foreclosure that corrects itself over the long-term. This effect may be related to where investors are willing to initially purchase properties: investors are less likely overall to purchase properties in neighborhoods with high violent crime rates. Furthermore, when investor properties are foreclosed upon in Hispanic neighborhoods, there is a decrease in violent and total crime. Housing speculators have played a significant role in the foreclosure-crime relationship. Foreclosures on investors can trigger immediate and short-term increases in property crime, and lower rates of violent-crime. Although these effects are not lasting, the type of homeowner undergoing foreclosure is consequential for neighborhoods in the short-term. Neighborhoods, on the other hand, seem to be resilient to these crime inducing effects, particularly neighborhoods with a large Hispanic population. These findings can be used by cities and local police departments to make targeted decisions for crime prevention. Interventions need only be temporary, concentrate on neighborhoods with a substantial number of foreclosures on investors, and focus on property crime. Alyssa W. Chamberlain examines neighborhood dynamics related to changes in social and demographic structure, housing, and inequality and the spatial distribution of crime. She also examines issues related to prisoner reentry and corrections, including offender programming and treatment services, offender supervision, and neighborhood reintegration. Danielle Wallace has co-authored publications on neighborhood effects, crime, demography, and health, which appear in The American Sociological Review and The American Journal of Public Health. Her research interests begin in criminology, and then branch into the overlap between criminology and urban sociology, neighborhood studies, and research methods. Deirdre Pfeiffer is an Assistant Professor in the School of Geographical Sciences and Urban Planning at Arizona State University. Her research focuses on housing strategies in the U.S. relevant to an aging and diversifying society, the outcomes of the foreclosure crisis, and the relationship between suburban growth and racial equity. Janne E. Gaub is a senior project manager at the Center for Violence Prevention and Community Safety at Arizona State University. She earned her Ph.D. in criminology and criminal justice from ASU in 2015. Her research interests center on policing, including technology, misconduct, and gender. Her work has been published in Women & Criminal Justice.